1. It effictively treats cosmetic problems that other techniques were unable to treat with the same results. 4. It stimulates the regeneration process of our body by means of a perfectly localized and controlled “artificial fever” with aesthetic purposes. 5. It can be applied on different body parts, even when those are hard to reach. 6. It allows you to treat not only the consequences but also the origin of the problem. 7. It improves the absorption of cosmetic active ingredients, transmitting the active agent through the skin. Corporal aesthetics encounter a valuable ally in the hyperthermical radiofrequency device CIM 3.0 when treating of cellulite and flaccidity. Thanks to the biomolecular acceleration it generates inside the tissues, it obtains surprising results in aesthetic lymphatic drainage and water retention. The improvement in the adherence of the skin to the muscle explains the success of this technique when treating flaccidity of the arms, adductors, buttocks and breasts. CIM 3.0 Biomolecular Accelerator performs a remarkable cohesive action on the skin, adhering it to the muscle, which as a result, redefines the contours of the face. . 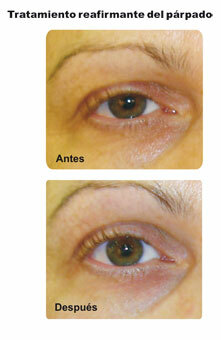 The effect on the muscle tone is also visible in the contour of the eyes and in the cheek area.